After rewriting the XML code of my blog template, which took a considerable degree of problem solving I was faced with some pottery problems. The problem with this series of plates was the contrasting colors of clay on my trimming chuck. 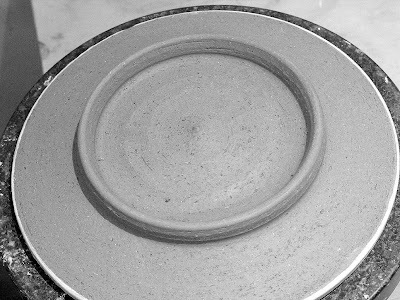 I trim the feet of these pots on a clay donut that is slightly larger in diameter than the plate or bowl I am trimming. This way I can quickly lift the pot and get a feel of it's trimmed weight and return it to continue if needed. This approach is usually pretty efficient. But with the white kaolin slip already on the pots and the red dirt clay as my chuck I was getting some smearing on the pots. So I thought it would paint the chuck with the white kaolin slip and avoid the smearing. But since the slip is very fine grained and smooth, I lost the grip of the coarse red dirt clay. It actually was so slick that this plate slipped off the chuck and got some bad bruises! I ended up going back to three clay coils to hold the plates in place. A little slower, but always reliable. I usually cut out the little peak that I get when trimming the foot. 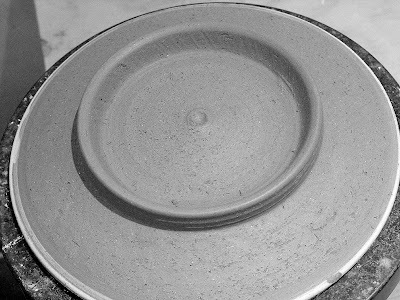 One of my mentors, Michael Simon always had these beautiful peaks under his cups, bowls, and plates. 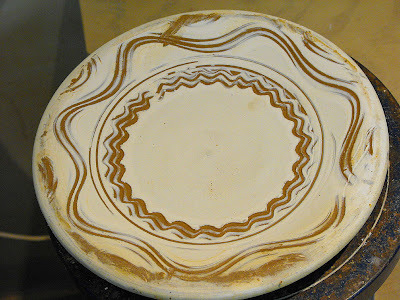 For many years it gave me great pleasure to try to get a nice point on my pots, too. One day though, I decided it was time for that point to go and decided from that day on to cut it out! Now I call it the belly button! Every once in a while I leave the point. After all, cutting it out seems a little contrived even though I like the belly button. I think a lot about Michael when I make pots, even though I don't try to make the pots he makes, his commitment and mastery continue to inspire.